I confess that I am an ice cream addict. I would have no problem eating a bowl of ice cream every night (and some weeks, I do). I blame it on my parents and the ubiquitous half-gallon of Breyer's we had in the freezer growing up. And while I do love a good milkshake (looking at you, Cook-Out), rarely do I make them at home. 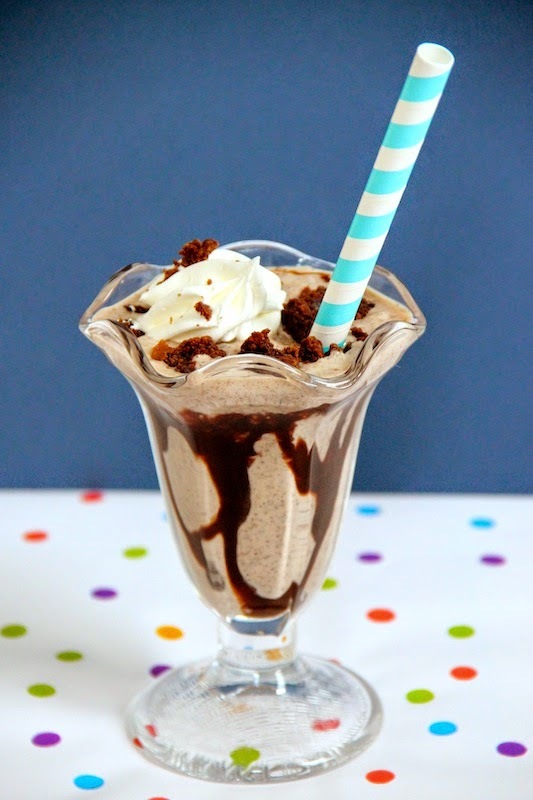 So this weekend I threw together this mocha brownie milkshake to switch things up a bit. The brownies that I used were from an Immaculate Baking mix. Have you tried their products? Their new dry baking mixes have no trans fat and do not contain any artificial preservatives or high fructose corn syrup! Two thumbs up. You can find their new baking mixes in the baking aisle at Target. Place all ingredients in a blender. Blend until smooth with tiny brownie pieces visible. Drizzle chocolate syrup on inside of a glass. Pour in milkshake and serve with whipped cream and crumbled brownie pieces. Makes 2 large or 3 small milkshakes. Yum! And, yes, definitely blame it on the parents.